Digital Pathology is a rapidly expanding ecosystem of whole-slide scanning and bioinformatics solutions, which is revolutionizing the medical diagnostics workflow. Digital Pathology systems offer high-throughput, cost-effective solutions for collecting, storing, and interpreting digital images of stained (labeled) tissue specimens. With the number of new cancer cases predicted to increase steadily to over 20 million by 2030, digital pathology has been pivotal in increasing throughput with slide scanners, artificial intelligence, and machine learning.1 These techniques continue to be validated as the FDA approves new instruments and processes, such as the Phillips IntelliSite Pathology Solutions (PIPS).2 These powerful, well-established techniques continue to form the backbone of the pathology workflow, but require substantial ongoing investments in high-quality sample preparation to maintain accuracy and efficiency. For more information on Digital Pathology, visit: www.digitalpathologyassociation.org. Until recently, chemical staining or labeling, by using IHC stains or fluorescent tags was the only viable option for a researcher or pathologist to visualize diagnostic markers present within the tissue sections. Furthermore, using labels limits the potential for discovering new biomarkers within the sample. The Digital Pathology community is working hard to offer a new class of powerful label-free digital imaging solutions which could greatly reduce healthcare costs while simplifying the histology workflow and accelerating discovery. Second harmonic generation (SHG) and mid-infrared (MIR) microscopy are two examples of well-established optical techniques which have recently demonstrated viability as label-free digital pathology solutions due to advancements in technology and ease-of-use. For example, MIR digital imaging recently experienced a greater than 100-fold increase in throughput enabling single large-tissue specimens to be analyzed in minutes rather than days. This enhancement was made possible through the advent of new MIR quantum cascade laser (QCL) sources employed in a novel wide-field illumination mode. The MIR spectral region, roughly spanning 3,000 to 12,000 nm, is rich in organic molecular information which can be analyzed to perform quantitative digital tissue classification, identify and track disease progression and study the tumor microenvironment. 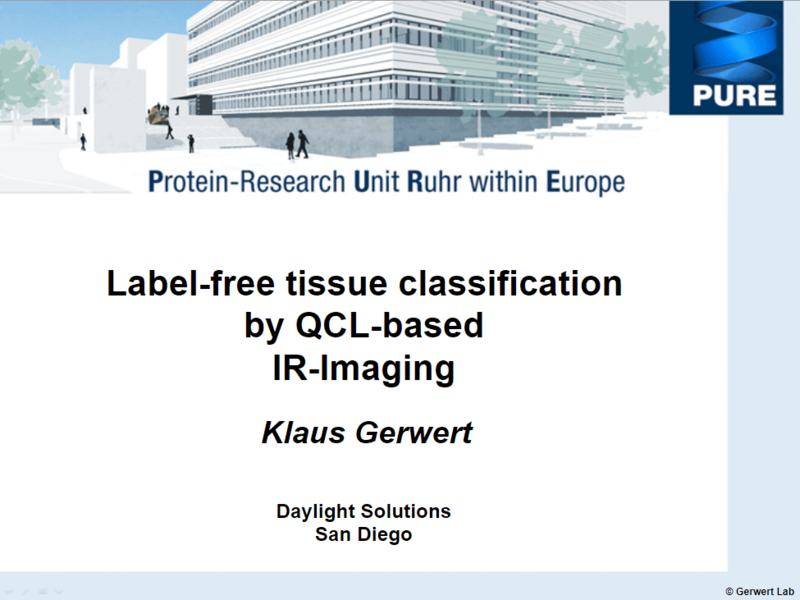 At the PURE Institute, a research team, led by Professor Dr. Klaus Gerwert, is using Spero-QT® MIR microscopes to perform fast, label-free, automated tissue classification of cancer tissues.3 By coupling quantitative MIR data with advanced machine learning and AI image analysis, the research group at PURE has demonstrated the ability to automate tissue image analytics and the rendering of differential diagnoses in multiple organ systems. To date, the team has analyzed 110 tissue samples from stage-2 colorectal cancer patients and results indicated 100% selectivity and 96% sensitivity compared to classical histopathology. The team also compared results from two different Spero-QT machines and found that results were independent of the machine or user, paving the way for its broader implementation of Spero-based digital pathology. Larger colon cancer studies and other primary organ studies are underway. The Spero-QT microscope is the only commercially-available QCL-based, wide-field MIR digital imaging platform on the market. Learn more about the Spero-QT through our on-demand webinars and library of published research. DRS Daylight Solutions is interested in partnering with other industry experts, digital pathology companies, and research institutions that share our vision in making meaningful breakthroughs in the biomedical sciences. Contact us to learn more. NOTICE: Intended for research applications only. The Spero-QT is not designed or intended for diagnosis or treatment of diseases. DRS Daylight Solutions is excited to present a webinar by Prof. Dr. Klaus Gerwert, Head of the Department of Biophysics and Founding Director of the Protein Diagnostics Institute at Ruhr University Bochum (Germany). The webinar will showcase the power of combining high-speed, mid-IR imaging with advanced machine learning to perform automated characterization of cancer tissues on clinically relevant timescales. Learn how this groundbreaking approach is revolutionizing the classical histopathology and omics workflows. Researchers at the Ruhr University Bochum (Bochum, Germany) took a major step towards the clinical translation of mid-IR imaging. 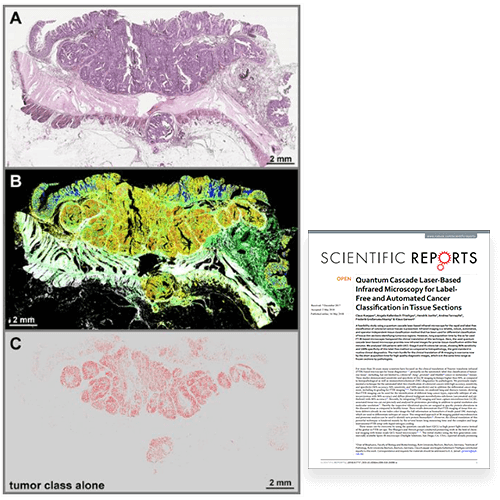 In a 110 patient feasibility study, the researchers used wide-field QCL microscopy combined with machine learning to automatically detect Stage II and III colorectal cancer in large (cm) unstained biopsied tissue sections in less than 30 minutes. The study results showing 96% sensitivity and 100% specificity were found to be independent of instrument and operator and were achieved without the use of tissue microarrays. Interested in Label-free Digital Pathology?